Those who have tasted success have developed a taste for the finer things. They are more discerning when it comes to what they want to spend on, where they spend their time, how to live their lives. All these considerations of finer living are the things that Crown Asia understands. 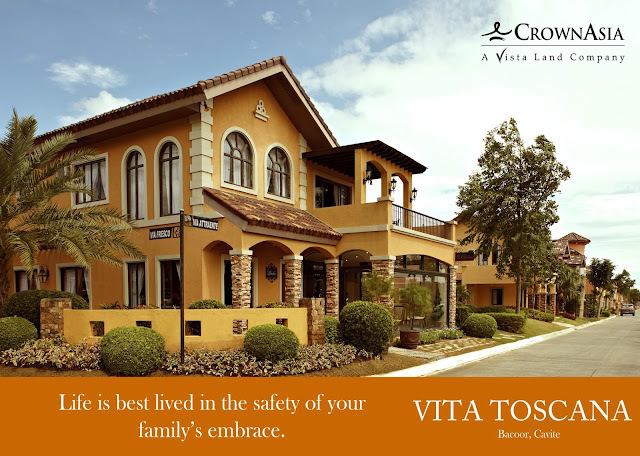 A forerunner in building quality theme-inspired homes for the upper middle market, Crown Asia has boldly captured the essence of fine living in one of its most premiere and exclusive projects – Vita Toscana. *Banco De Oro Bank Rates. Fixed Rate for 1 year; yearly repricing after the fixing period. 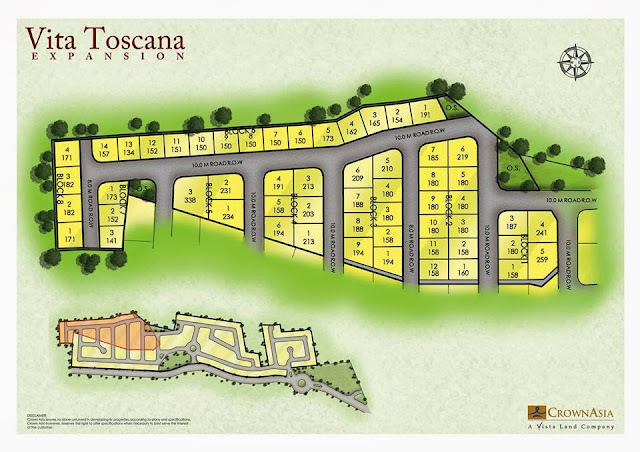 Vita Toscana’s community harmonizes with nature and exudes luxurious comfort. This is being made evident in the community’s architectural design and stylized landscapes inspired by its Tuscan theme, quality materials, secure surroundings and wide open spaces. The new expansion, “Sole Vita Toscana,” even brings more premium to the development as it features bigger lot cuts and house models that allows more spacious accommodations. All of which are meant to enhance the moments that families spend together. Truly the lifestyle only the elite few can experience. Experience what it's like to live in Tuscany in Vita Toscana. The atmospher is warm, charmingly rustic across the landscape. At the Vita Toscana, you enjoy life in the quaint magnificent spirit of the Tuscan countryside. Engage in your favorite recreational activities such as basketball, swimming and tennis in our well-appointed clubhouse. It’s all there for you and your family at Vita Toscana. More than the classic Italian architecture and plush landscaping, Vita Toscana boasts of exquisite amenities such as a grand swimming pool, basketball court and lush open spaces. Residents are also afforded premium utilities such as overhead utilities for cable, power and communication, alternate day garbage collection, deep wells with overhead tank (1,800 gallons) and professional property management team – Global Land. Even the choice of location must be seen as a “reward” to the residents. Residents of Vita Toscana will surely find the conveniences of modern living close by. Lifestyle centers such as SM Bacoor, SM Molino, Robinsons Imus, Puregold Bacoor, Puregold Molino are all a few minutes away. SM Mall of Asia is a short 30-minute drive via nearby Coastal Road. Finds Convenience Store is made available just at the entrance of the community. 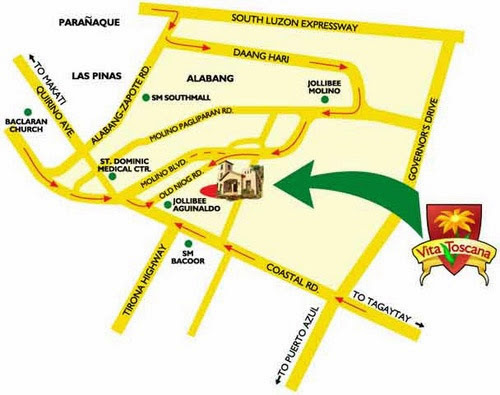 Educational Institutions such as Palmridge School – Citta Italia, University of Perpetual Help Molino, Statefields International School, St.Dominic Medical College are all within the area. Modern hospitals such as Molino Doctors, St.Dominic Hospital, St.Michael Medical Center, Medical Center Imus and Metro South Medical Center are also within proximity. in your beautiful Vita Toscana home. Share a finer quality of living with family and friends. inspired community make the perfect setting for the best of memories. is located along Molino Boulevard in Bacoor, Cavite.